Sir Francis Dashwood, Bt. 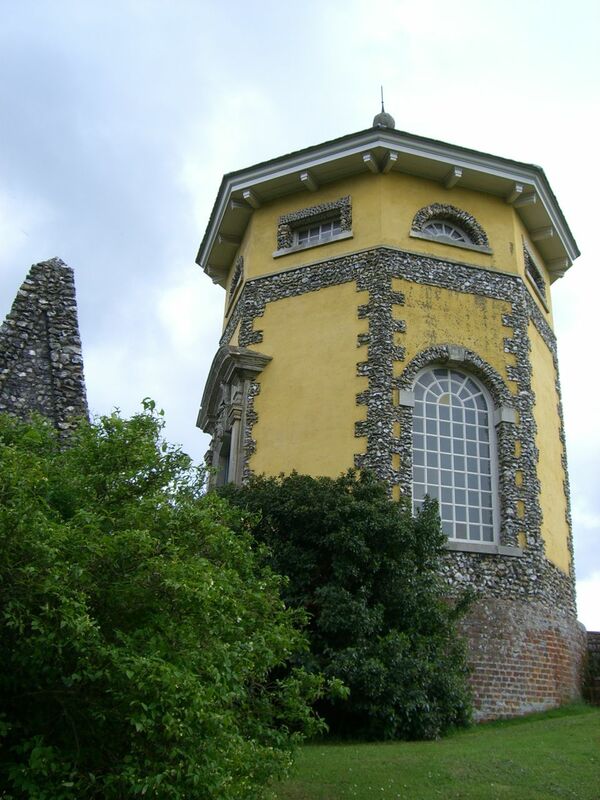 (1708-1781), is the person with whom the landscape of West Wycombe has become synonymous. Dashwood was raised by a guardian, his uncle John Fane, 7th Earl of Westmoreland, after his mother’s death in 1710. It is through Westmoreland that Dashwood was first introduced to one of the great interests of his life, architecture. Westmoreland hired Colen Campbell to design his seat, Mereworth Castle, Kent (1723-5). 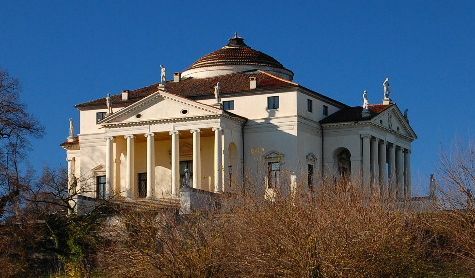 Based on Palladio’s Villa Rotunda, it is one of the earliest examples of Burlingtonian Palladianism, making a conscious effort to cite classical examples in its interiors. His gardens included follies, such as Campbell’s 1725 interpretation of Titus’ Arch in Rome. Dashwood’s further developed an interest in landscape and architecture on several grand tours, which took him not only to France and Italy, but to Germany, Russia, and the Ottoman Empire. In fact, he was travelling as early as 1726, with tours in 1730-1, 1733, 1735, and 1739-40. With his companions on these tours, he formed a variety of institutions whose members had active interests in architecture and antiquities, including the Egyptian Society, the Divan Society, and the Society of Dilettanti. As sites of homosocial conviviality, these organizations shaped Dashwood’s social world. And, when he redesigned West Wycombe from the 1740s, they played a role in influencing his architectural program. Dashwood’s country house and grounds were on the south side of West Wycombe’s high street. On the northwest side of the village was a hill on which sat the parish church, St. Lawrence. As a supporter of the concept that public works projects should be voluntarily funded by local gentlemen in times of need – in fact, to this ideal he supported a poor relief bill in 1747 – Dashwood was responsible for a series of architectural and topographic works that put locals to work. With the crop failures of 1750, Dashwood employed the agricultural workers of West Wycombe to excavate chalk from the hill, which he used to repave the Oxford road. The flint that was excavated with the chalk was used in new buildings across the estate and in the town. It provided an unfinished rustic look that was popular at mid century. Likewise, during a period of intermittent grain shortages in the 1760s, Dashwood rebuilt the parish church, St. Lawrence. This was not only important for the builders, but for the West Wycombe furniture makers as well. 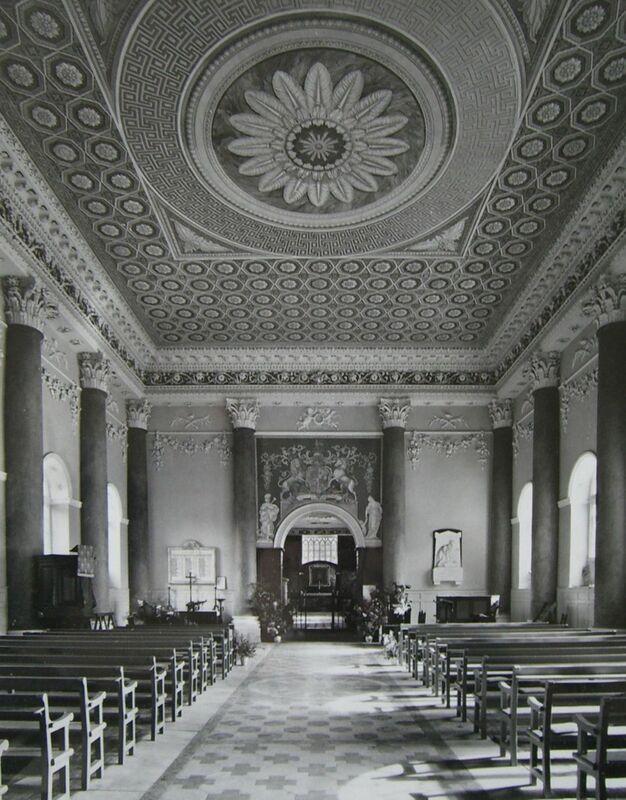 Dashwood hired them to refit the church, which, opened on 10 June 1763 to “a suitable Anthem,” included a £6000 organ, and had “Seats covered with green Cloth.” The design of this church was, no doubt, the result of his uncle’s influence. Westmoreland rebuilt the parish church of St. Lawrence, Mereworth between 1744 and 1746. 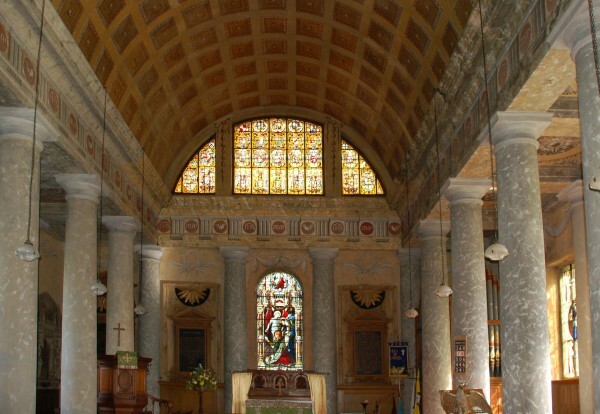 The design integrated neoclassical themes such as a barrel-vaulted nave with faux-painted coffering. In conception, the later redesign of Dashwood’s St. Lawrence Church in West Wycombe was similar. It also used neoclassical themes — most spectacularly, a ceiling painted to resemble one in Palmyra. Both resemble eighteenth-century assembly rooms as much as they resemble churches. In addition to his projects in the village, Dashwood, like his uncle Westmoreland, set out to reimagine his estate. Beginning with the house, Dashwood hired John Donowell as his architect – or, more accurately, his clerk of works – between 1755 and 1764. Donowell planned the re-façade of the north and east fronts. 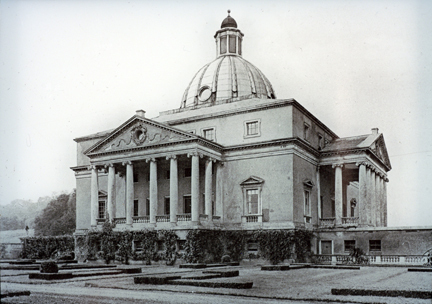 The Palladian north front has similarities to Inigo Jones’s Somerset House, Colen Campbell’s Pembroke House (1724), as well as Isaac Ware’s design for Amisfield House, East Lothian (1756). And, one historian has claimed that Isaac Ware was in fact the architect. The east side is a Roman Doric portico, which blends elements of the Ionic entrance at Mereworth Castle, designed by Roger Morris, and the Roman Doric portico on the Mereworth pavilion, probably designed by Henry Flitcroft. 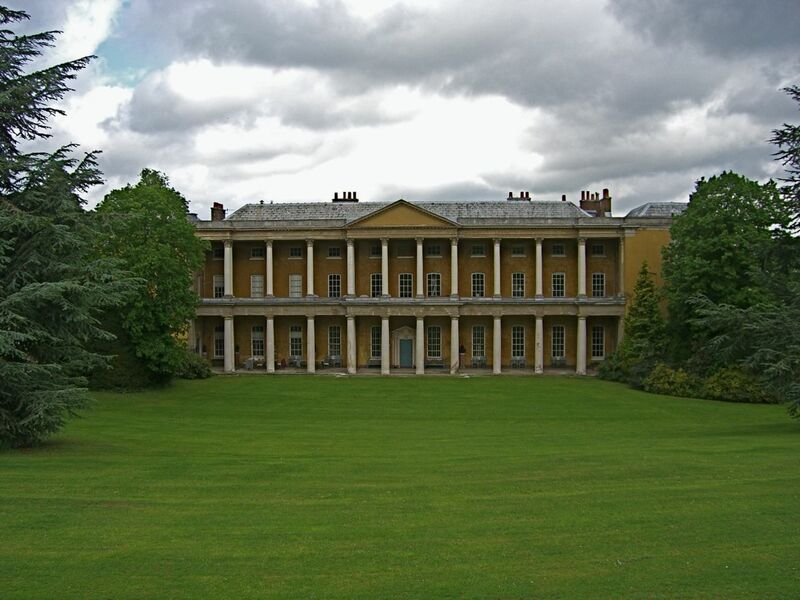 On the south side, a colonnade retains the Palladian themes of the north and east facades. However, it is much more daring in its execution. It hass a double-height loggia, with a pedimented center. 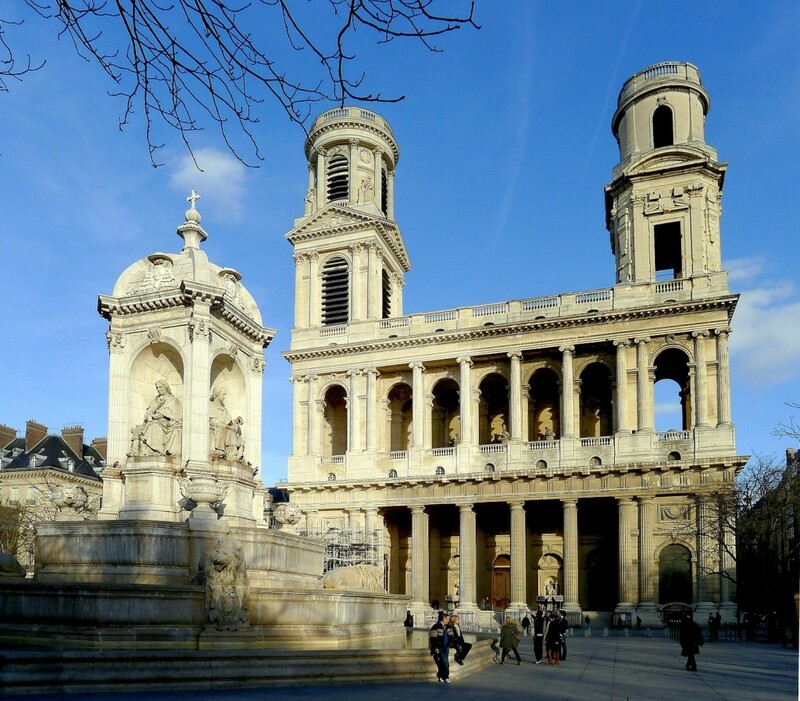 With a baseless Roman Doric lower loggia and a Corinthian upper loggia, it is similar to Giovanni Servandoni’s St. Sulpice, Paris (1732). While Servandoni was in England between 1747 and 1751, it is more likely that the designer was his student Maurice-Louis Jolivet, who worked as “Architect” to Dashwood. The west front, redesigned by Dashwood’s fellow Dilettanti, Nicholas Revett in 1771, was the first neoclassical element of the main building. Based on the Temple of Dionysus at Teos, Revett’s Ionic portico was a dramatic innovation in architectural approach – using on-site drawings of classical temples as models for modern architecture. Likewise, Dashwood redesigned his gardens. Originally “laid out in 1739, into walks which are beautified with water,” Dashwood worked with his architect – in this case, probably Jolivet, who did a 1752 survey of the park – to create a symbolic program similar to Stowe. Damming the River Wye, Dashwood created the lake and many of the paths to the north. Jolivet’s program was transformed by Nicholas Revett and Thomas Cook to reflect the picturesque aesthetic during the 1770s. Thus, the house, garden, and village church initially seem the epitome of eighteenth-century design – reflecting the changing tastes and innovations of the polite arts. That is one story of West Wycombe – the mundane story that, were this any other house, historians would have been content to tell. However, there is another side to the West Wycombe landscape. According to local traditions that have since dominated scholarly and popular lore, West Wycombe is much more than the quiet place that it pretends to be. In the landscape, a code hides – an archive of secret events that has proven too tantalizing to ignore, too profitable to reject, and too convincing to contradict. Citation: Jason M. Kelly, “West Wycombe and Its Architecture,” Secrets of the Hellfire Club Blog (26 February 2012), https://hellfiresecrets.wordpress.com/2012/02/26/west-wycombe-and-its-architecture/. Dashwood was also a member of the Beefsteak Club, the Bucks (aka Bloods), Lincoln Club, (ca. mid 1740s), Royal Society (1746), the Society for the Encouragement of Arts, Manufactures, and Commerce (1754), and the Society of Antiquaries of London (1769). Betty Kemp, Sir Francis Dashwood: An Eighteenth Century Independent (London: Macmillan, 1967), 12, 119. Nikolaus Pevsner and Elizabeth Williamson, Buckinghamshire, 2nd ed. (New Haven: Yale University Press, 1994), 27. Samuel Lewis, A Topographical History of England, vol. 4 (1831), 585; Ashton, Economic Fluctuations in England 1700-1800, pp. 36-7. Barrows Worcestershire Journal, 14 June 1763; Gentleman’s Magazine (July 1763), p. 359; Nichols, Literary Anecdotes, vol. 7, pp. 683-4. Howard Colvin, A Biographical Dictionary of British Architects, 1600-1840, 3rd ed. (New Haven: Yale University Press, 1998), 269–70. Pevsner and Williamson, Buckinghamshire, 729. Anne Purchas, “Maurice-Louis Jolivet’s Drawings at West Wycombe Park,” Architectural History 37 (1994): 68–79. See Jason M. Kelly, The Society of Dilettanti: Archaeology and Identity in the British Enlightenment (London and New Haven: The Paul Mellon Centre for Studies in British Art and Yale University Press, 2009). Historical Manuscripts Commission, “A Tour in Wales, 1769,” in Report on the Manuscripts of the Earl of Verulam, Preserved at Gorhambury (London, 1906), 243; Pevsner and Williamson, Buckinghamshire, 733. This entry was posted on Sunday, February 26th, 2012 at 07:31	and posted in Architecture, History. You can follow any responses to this entry through the RSS 2.0 feed.